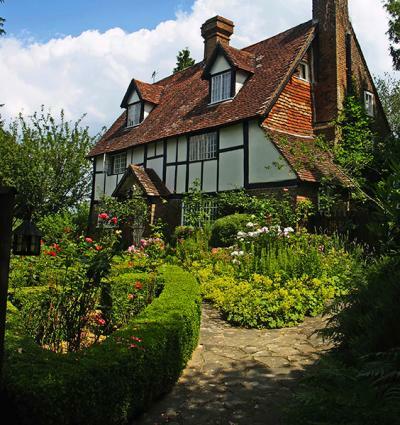 Popular English gardens come in a few distinct styles such as the English country garden, the classic English garden, and the English cottage garden. In spite of the names, they belong in England only as much as impressionism in painting belongs to Claude Monet. Anyone anywhere in the world can enjoy gardens incorporating the typical features of these time-tested styles. Gardening in England underwent a series of transformations over the ages. The natural landscape gardens in the 18th century, which came to be known as English country gardens, or simply jardin anglais, may be considered a deliberate rebellion in garden design against the rigidity of the formal French-style knot gardens of the 17th century England. Romanticizing the natural beauty of English countryside, and taming it to suit the lifestyles of the English gentry, vast expanses of land was remodeled to feature rolling lawns ending in groves of trees or merging into large lakes or flowing springs. Flower beds, flowering shrubs, and such other attempts to add color to the landscape are conspicuous by their absence. Well worn pathways in the grass made by walking can lead to different elements of interest in the garden. They are not paved. Clipped and shaped hedges, as well as topiaries, are consciously avoided so that the landscape looks open, airy, and natural. Large areas of lawn modeled after the undulating meadows of the countryside make up the majority of this garden style. A garden structure built to resemble a Greek monopteros or a Chinese pavilion is common. Statues or carefully constructed ruins add some interest to the landscape. Water features, such as a natural lake or artificial pond made to look natural, are often part of the garden design. Frequently included is a footbridge across the water body or pier overlooking it. Flower beds and pruned shrubs have no place in the natural landscape style of the English country garden. A mixed planting of native shrubs along the water's edge is left to grow and spread in a natural way. Occasional trimming may be necessary. Native species of trees and what grows naturally in the surrounding area are preferred over exotic specimens from foreign lands. They are planted close together to resemble a naturally occurring grove. William Kent and the famous English poet Alexander Pope were connoisseurs of the country garden. Nineteenth century American landscape designer Andrew Jackson Downing promoted landscape gardening based on the English country gardens. Frederick Law Olmsted, who designed the Central Park in Manhattan, freely applied these principles in his works. The Natural Garden by Ken Druse gives valuable ideas to replicate this gardening style on a smaller scale. After the romantic spell of the landscaped countryside scenes which were, to borrow the words of Walter Pater, "almost offensively green", the garden design eventually returned to formality with careful addition of color during the Victorian Era. The classic English garden style borrows heavily from the 20th century Victorian gardens that are found in every continent the British had a presence at that time. Refinement in design and well-manicured looks are the main characteristics of the classic garden. Geometrical shapes dominate, and they provide a neat framework for the predetermined areas of ornamental flowers, shrubs, trees and even some vegetables and herbs. "A place for everything and everything in its place" can very well be the guiding principle here. A wide, brick-paved or graveled pathway connecting the entrance and exit of the garden in a straight line typically forms the main axis. Horizontal pathways may arise from the main path. 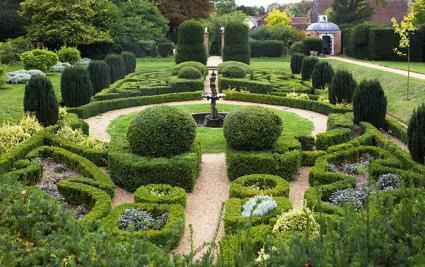 Neatly clipped hedges form the geometrical framework of the classic English garden. The main pathways, as well as those branching off from them, have hedge borders. Taking into account space constraints, need for privacy, and display of flower beds beyond, they can be tall yew hedges or shorter box hedges. Perfectly laid out lawns have a major role in the classic design. The spaces between the hedges are planted with grass, except where vegetable patches are planned. Each lawn may have a special feature such as a pool, glass house, gazebo, or an open seating area. Structures like gazebos, arbors, and seating arrangements that facilitate outdoor life in the garden are together referred to as an "Outdoor Room" in classic gardens, and designing a small area for this room is a must in any classic English garden. A fountain or birdbath in the center of the garden, or a rectangular or circular pool in the middle of the lawn, constitutes the water element in the classic English garden. Flower beds have annuals or perennials planted in rows next to low hedges or in a circle in the middle of the lawn. Pastels are preferred over bright colors, but new varieties currently in fashion often find a place in the garden. Even monochromatic schemes, such as white gardens, may be planned and can be displayed to advantage against the green background. Larger shrubs are planted singly or in small groups dotting the lawn or at regular intervals along the length of the hedge. A general belief is that the crown of a plant is about the same size as its root spread; hence it is taken into account while determining optimum spacing between each type of plant. Care is taken to keep them pruned to maintain uniformity. Conifers are usually clipped into columns or pyramids or other interesting topiary. However, exotic trees of special interest are often allowed to maintain their natural form. If formality is the hallmark of the classic style, the lack of it defines the English cottage garden. Their humble origins lie in the highly utilitarian gardens of the peasantry and working class families of olden times. However, the sheer exuberance and the delightful informality of cottage gardens have made them as popular as, if not more than, the classic style with those in every walk of life. It is the ideal style for those who like to putter around the garden and enjoy the fruits of their labor. Cottage garden plantings may look informal, but that does not mean that they happen by chance. A lot of planning goes into the designing of a delightful cottage garden even though improvisation can be easily accommodated at any time. Geoff Hamilton's Cottage Gardens can take you through the history and details of a variety of garden designs. An integral part of garden design, curvaceous walkways of the cottage garden make flower beds and seating areas accessible. They may be nothing more than a narrow mud or gravel path edged with either bricks or a variety of plantings that serve as a border. They are not an essential part of cottage gardens, but unplanted areas may be covered by grass to suit the personal preference. Curvy lines may be preferable to straight lines to maintain the informal character. Fashioned out of wood or iron and covered with climbers, trellises, arches, and fences add charm as well as vertical interest to the cottage garden. Roses are a traditional favorite climbing choice, but other flowering climbers like clematis or climbing hydrangea can be just as lovely. Select climbers with scented flowers such as sweet pea or jasmine to plant near seating areas. Wooden or wrought iron benches may be placed in areas that offer a great view of the garden. Urns, statues, and sculptures also can add to the visual interest. There is nothing like a picket fence to transform any garden into an English cottage garden. Painted white or blue, they can be the ideal backdrop for flower beds or a seating area within a small lawn. A birdbath or a small lily pond can add interest to the cottage garden, particularly when fashioned out of recycled materials. Perennials are the backbone of flower beds with a few annuals added for interest. They are planted close together to display a mass of color when in flower. Bright, eye-catching flowers are welcomed but deliberate color schemes are shunned by cottage gardeners. A few foliage plants for color and texture, some herbs for the kitchen and the medicine chest, and a few fruit and vegetable crops complete the picture. Shorter plants form the foreground and taller ones are relegated to the back of the bed. A few fruit trees may be espaliered against the wall to bear maximum fruit in minimum space. 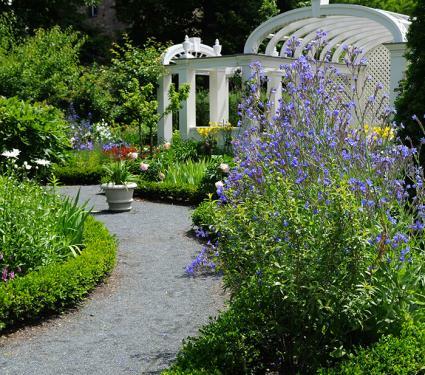 Follow this garden plan to construct a pretty English garden in your landscape. If you need help downloading the printable plan, check out these helpful tips. 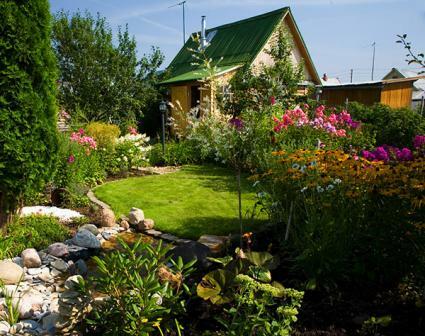 No matter which garden style you choose, be sure to do your research before starting your project. 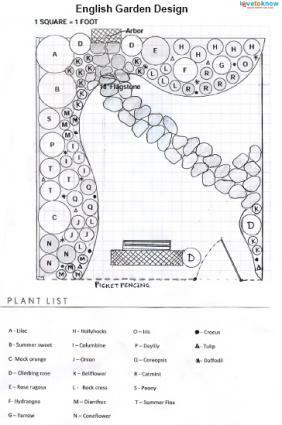 Be sure to make a drawing outlining the garden elements including a list of plants that you wish to include. This will serve as a blueprint for your garden and will make construction much easier.